Werder welcome Augsburg to the Weserstadion on Sunday (Photo: nordphoto). Werder are looking to end an eventful birthday week with a victory over Augsburg this Sunday. “It’s a super important game for us. If we get the points, we’re right in the mix for the upper places of the table. The fans will also make sure that it’s a special game,” said Florian Kohfeldt. The game kicks off at 15:30 CET on Sunday 10 February. Previous meetings: It was a rollercoaster of emotions for Werder fans in the previous fixture, with Kohfeldt’s side initially struggling due to how deep Augsburg were sitting. In the 30th minute, that changed. First, Max Kruse put his side ahead before a great goal from Maxi Eggestein put Werder further in front. The home side then got one back before the break through Ja-Cheol Koo. After half time, Philipp Max scored a volley to equalise for Augsburg, and both sides had chances to win the game. However, it was the Green-Whites that took theirs through Davy Klaassen after a mistake from the Augsburg goalkeeper. Werder won the game 3-2. Philipp Bargfrede is back following his suspension (Photo: nordphoto). 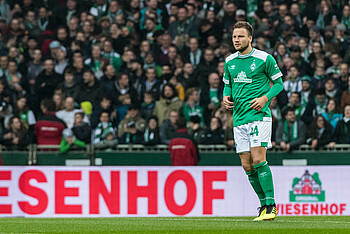 Squad news: Werder will be without Martin Harnik for a reasonable length of time after he picked up an injury in the win over Dortmund during the week. However, he’s the only player that Florian Kohfeldt will have to do without. Yuya Osako has returned fit from the Asian Cup and will be available for the game. 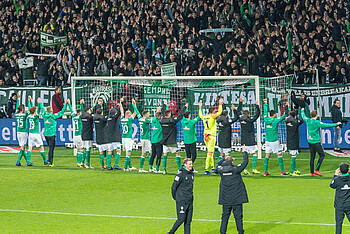 Werder want to end their birthday week with a win on Sunday (Photo: nordphoto). The opponents: Augsburg won last weekend after not recording a victory in their previous nine Bundesliga games. Beating Mainz 3-0, they picked up some vital points in the fight to beat the drop. Augsburg also recently appointed Jens Lehmann as a coach, who will bring the club vital experience. After 20 games, the club lie in 15th place with 18 points. Like Werder, Augsburg also won in the DFB-Pokal mid-week, beating Holstein Kiel 1-0. Key player: Alfred Finnbogason. The Icelandic striker scored a hat-trick against Mainz last weekend, and is in the top three goalscorers in the Bundesliga, with ten goals. He’s converted all eight of his penalties he’s taken in the league so far. Since his international debut in 2010, he’s scored 15 goals in 52 games for Iceland. One thing is for sure, he’s dangerous in front of goal. The officials: Manuel Gräfe will take charge of the game, with Guido Kleve and Markus Sinn the linesmen. The fourth official is René Rohde, and the video assistants are Daniel Schlager and Benedikt Kempkes.